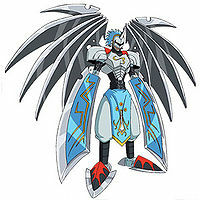 A Power Digimon that commands the Powers and cuts through the vanguard in battle. As it persists in justice, it does not fear death. 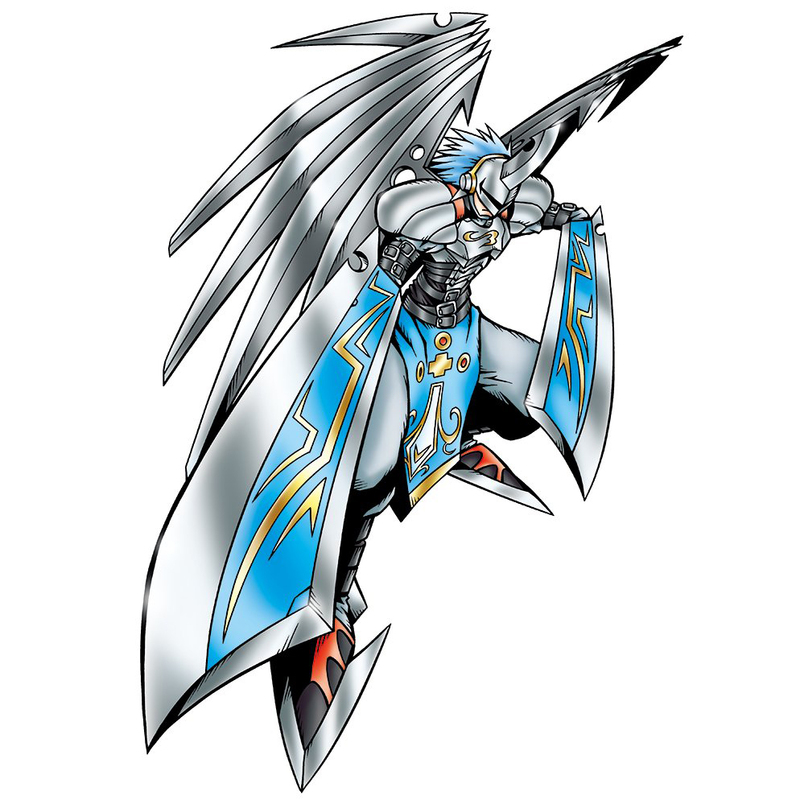 Along with the blades of its metal wings and hands, its entire body has gained a razor-sharp appearance, and it is surely an Angel Warrior created in order to battle wicked beings. Its Signature Move is "Holy Espada". 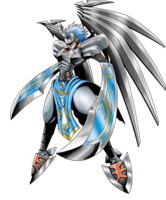 Its Special Move is charging at the opponent with staggering momentum, cutting them to pieces with the blades covering its body (Heaven's Ripper). v., Slash (「スラッシュ」 Surasshu) means to cut. 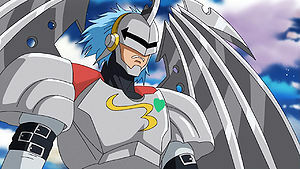 n., GuardiAnge is a portmanteau of Guardian Angel. 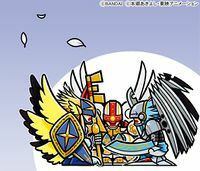 Anime/Manga Digimon Xros Wars: "Heaven Zone, The Snare of Paradise!" Can be obtained by having Kotemon at level 40, or Kyukimon at level 99. Can be evolved from Kyukimon if above level 42, and Stress 5%-. 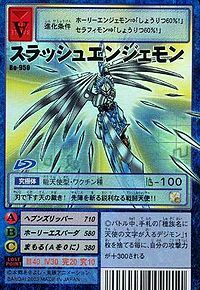 Can be evolved from Holy Angemon. 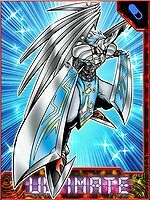 Can also obtained by Jogressing either of Kyukimon, Giromon or Piccolomon if above level 41, Machine EXP 8000+, and Attack 290+. 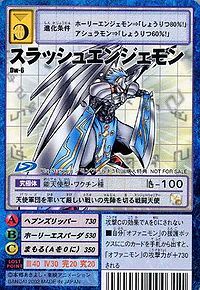 Can evolve to Duftmon if Jogressed with Grappu Leomon. 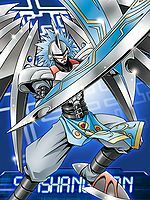 Slash Angemon is available as a Digimon Medal. Heaven's judgment is brought down with its blades! A sharp Angel Warrior who slashes through the frontlines!! 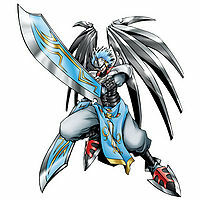 This angel fighter leads the Powers through harsh battles and slashes through the frontlines. This page was last modified on 17 February 2019, at 05:30.